Those long years spent scrimping and saving and sleeping in a third-rate casket have finally paid off, huh? After all that after-hours househunting, you’ve staked your claim on a prime piece of mouldering Victorian real estate—and you even scored a back-alley view! Now you’re probably itching to hold court with the other creatures of the night. Well, you might want to clean out your closet first, because you deserve to enjoy the fruits of your dark labors in some extra-special threads. 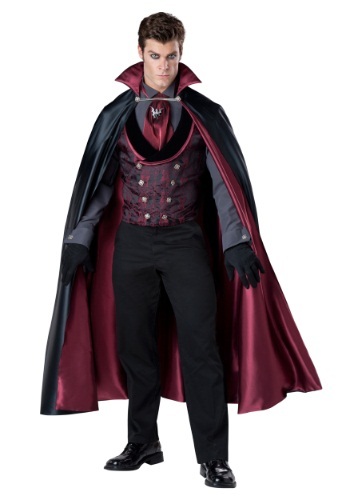 Like this Men’s Nocturnal Count Vampire Costume! Antique accents in satin, velvet, shantung, and taffeta lend a little gravitas to the sleek appearance of this updated vampire look. And while traditional features like the vest, cape, and gloves harken back to your Old World roots, this outfit makes them feel fresh again. It’s rare that a costume includes detailed accessories like a bat-shaped brooch and a chain clasp at the collar, but this one does! That makes it seem like the perfect attire for whatever celebration usually caps off a couple of long centuries lurking in the shadows, or catching up on your sleep! We don’t get invited to a lot of those parties, but we’ve heard pretty wild tales. But whether you plan on stepping out for the evening or just sharing a meal with that special someone, this striking suit combo is sure to turn some heads. And unless you really needed all that alone time, we think you’ll enjoy the extra attention!